Nothing says more about summer than a good barbecue. Getting together with friends, families and neighbors, enjoying some adult beverages, maybe even enjoying a swimming pool and the barbecue, now that’s a great way to enjoy a hot summer night! But unfortunately, not everyone has a barbecue or a pool. So what’s a girl to do?…. Turn up the air conditioner, put on some music, make a great barbecue sauce, bring out the grill pan and pour herself a beautiful glass of wine! Just because I live in a high rise with no outdoor grill or pool does not mean I cannot enjoy a good barbecue. I do have a lovely, landscaped rooftop with a picnic table that I can bring my prepared food to, light some candles and enjoy the evening city views. It’s very relaxing and I don’t have any regrets! Heck, I have a great view of the Empire State Building. For this evenings meal I served the barbecue sauce with some chicken leg, breast and wing. I also added an ear of corn and for a touch of sweetness, a sliced peach. All so lovely. 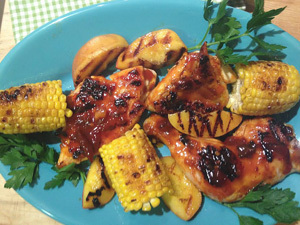 When you grill a peach it caramelizes and tastes so amazing. It provides that sweetness many of us crave, but without the guilty calories. So, go ahead and enjoy your indoor or outdoor grill devices, but most importantly enjoy them with the people you care for. Heat the oil in a saucepan over a medium low heat. Add the onions and sauté for about 3 minutes, stirring occasionally. Now add in the garlic and continue sautéing for another 2 minutes. Now add in the remaining ingredients and gently stir to combine. Turn the heat to low and simmer for about 20 minutes, stirring occasionally.